Drew Guthrie gets the game-winning hit for the Washington C.H. 12-year-old all-stars during their opening game at State against District One champions Jefferson, Saturday, July 15, 2017 at Maumee. Guthrie’s hit drove in pinch-runner Tate Landrum with the game’s only run for the all-stars. John Wall exhorts his team as he leaves the field for a pinch-runner after hitting a single in the bottom of the seventh inning of a State tournament game against Jefferson Saturday, July 15, 2017 in Maumee. The pinch-runner, Tate Landrum, would score the winning run on a hit by Drew Guthrie. Tanner Lemaster delivers a pitch for the Washington C.H. 12-year-old all-stars during their first game at State against Jefferson, Saturday, July 15, 2017 in Maumee. Tyler Tackage throws a pitch for the Washington C.H. 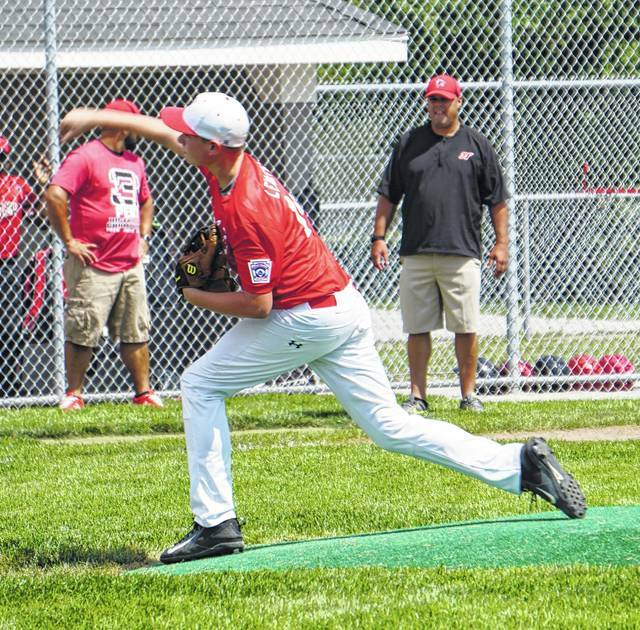 12-year-old all-stars during the second round game against Olentangy Sunday, July 16, 2017 at the State Little League tournament in Maumee, Ohio. The Washington C.H. 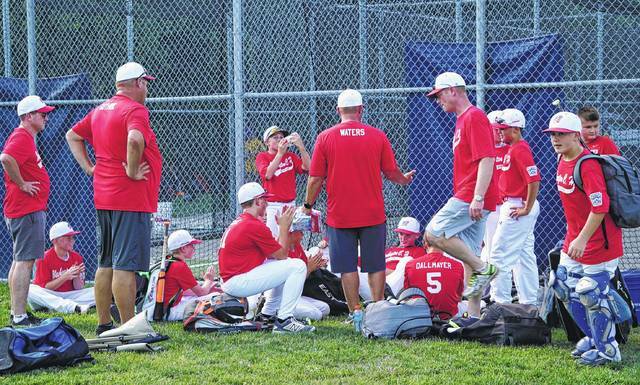 12-year-old all-stars meet with their coaches after a 1-0 win over Jefferson in 7 innings at the State Little League tournament in Maumee, Saturday, July 15, 2017. The Washington C.H. 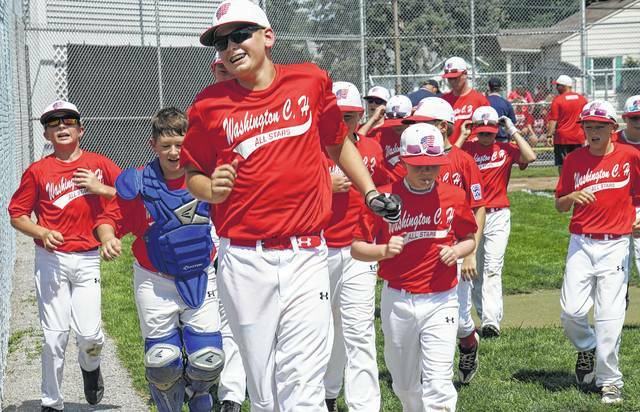 12-year-old all-stars exit the field after an exciting 1-0 win over Jefferson in the first round of the State Little League tournament in Maumee, Saturday, July 15, 2017. Wesley May was the winning pitcher for the Washington C.H. 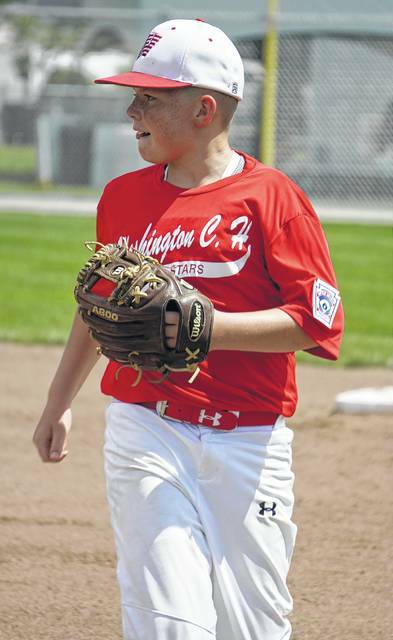 12-year-old all-stars against District One champion Jefferson at the State Little League tournament Saturday, July 14, 2017 in Maumee. MAUMEE — The Washington C.H. 12-year-old all-star Little League baseball team won its first game at State and then lost its second game heading into Monday evening’s game. The 12-year-old all-stars won their State tournament-opening game, 1-0 over District 1 champions Jefferson. The only run of the game was scored in the bottom of the seventh inning. John Wall singled, but the next two batters were retired. Tate Landrum was sent in as a pinch-runner for Wall. A.J. Dallmayer walked and both runners advanced to scoring position on a passed ball. Drew Guthrie hit a single that scored Landrum with the game-winning run. Washington lost its second game at State, 11-1 in four innings to Olentangy (District 6). Washington will be playing Wheelersburg Monday evening. Wheelersburg (District 11) lost to Maumee (District 10). Against Jefferson, John Wall was 1 for 4; Tyler Tackage was 2 for 4 with a double; Jonah Waters was 1 for 4; A.J. Dallmayer was 2 for 2 with two walks; Drew Guthrie was 2 for 4 with the game-winning RBI. Brady Armstrong was 1 for 2 and reached on an error; Brayden Kettles was 0 for 2; Tate Landrum was 0 for 1 with one run scored; Cole Little was 0 for 1; Tanner Lemaster was 0 for 2; Bryson Sheets was 0 for 1; Wesley May was 0 for 2 and Mason Coffman was 0 for 1. Lemaster started and pitched 1.1 innings with no hits, one walk and two strikeouts. May pitched 5.2 innings with one hit, one walk and six strikeouts. In the game against Olentangy, Washington scored one run in the second inning. Olentangy scored four in the first, five in the second and two in the fourth. Washington had six hits and Olentangy had nine. Offensively for Washington: John Wall was 2 for 3; Tyler Tackage was 0 for 2; Jonah Waters was 0 for 2; A.J. Dallmayer was 1 for 2. Drew Guthrie was 0 for 2; Brady Armstrong was 1 for 2; Brayden Kettles was 1 for 1; Cole Little was 0 for 1; Tanner Lemaster was 0 for 1 and reached on an error; Bryson Sheets was 0 for 1 and Tate Landrum was 1 for 2. Lemaster started and pitched one inning with five hits and six runs allowed. He walked two and did not strike out a batter. Tackage pitched 1.1 innings with two hits and three runs. He struck out one and walked one. Little pitched one inning with two hits and two runs. He had one walk. Kettles scored for Washington on a hit by Wall. https://www.recordherald.com/wp-content/uploads/sites/27/2017/07/web1_Drew-Guthrie-with-game-winning-hit-vs-Jefferson-at-State-7-15-2017.jpgDrew Guthrie gets the game-winning hit for the Washington C.H. 12-year-old all-stars during their opening game at State against District One champions Jefferson, Saturday, July 15, 2017 at Maumee. 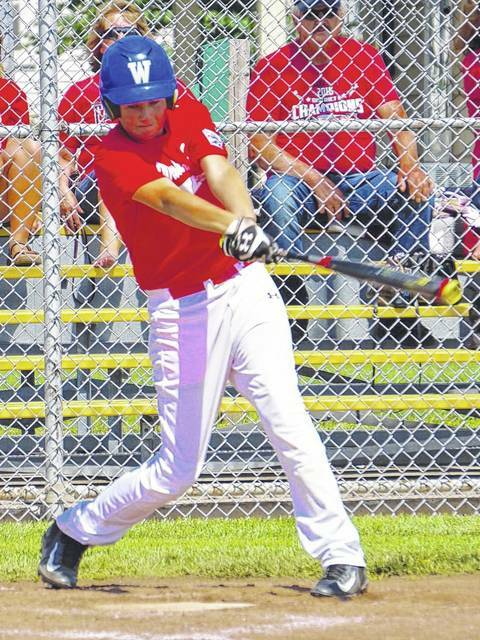 Guthrie’s hit drove in pinch-runner Tate Landrum with the game’s only run for the all-stars. https://www.recordherald.com/wp-content/uploads/sites/27/2017/07/web1_John-Wall-coming-off-field-after-hit-in-7th-vs-Jefferson-7-15-2017.jpgJohn Wall exhorts his team as he leaves the field for a pinch-runner after hitting a single in the bottom of the seventh inning of a State tournament game against Jefferson Saturday, July 15, 2017 in Maumee. The pinch-runner, Tate Landrum, would score the winning run on a hit by Drew Guthrie. 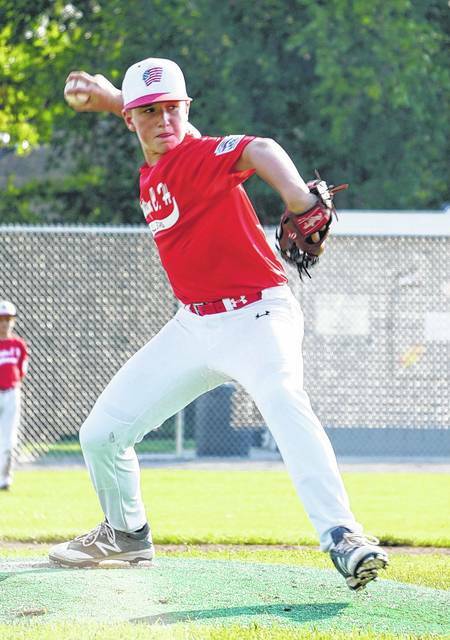 https://www.recordherald.com/wp-content/uploads/sites/27/2017/07/web1_Tanner-Lemaster-pitch-at-State-vs-Jefferson-7-15-2017.jpgTanner Lemaster delivers a pitch for the Washington C.H. 12-year-old all-stars during their first game at State against Jefferson, Saturday, July 15, 2017 in Maumee. https://www.recordherald.com/wp-content/uploads/sites/27/2017/07/web1_Tyler-Tackage-pitch-vs-Olentangy-7-16-2017.jpgTyler Tackage throws a pitch for the Washington C.H. 12-year-old all-stars during the second round game against Olentangy Sunday, July 16, 2017 at the State Little League tournament in Maumee, Ohio. https://www.recordherald.com/wp-content/uploads/sites/27/2017/07/web1_WCH-12s-after-beating-Jefferson-7-15-2017.jpgThe Washington C.H. 12-year-old all-stars meet with their coaches after a 1-0 win over Jefferson in 7 innings at the State Little League tournament in Maumee, Saturday, July 15, 2017.
https://www.recordherald.com/wp-content/uploads/sites/27/2017/07/web1_WCH-12s-exit-field-at-State-after-beating-jefferson-7-15-2017.jpgThe Washington C.H. 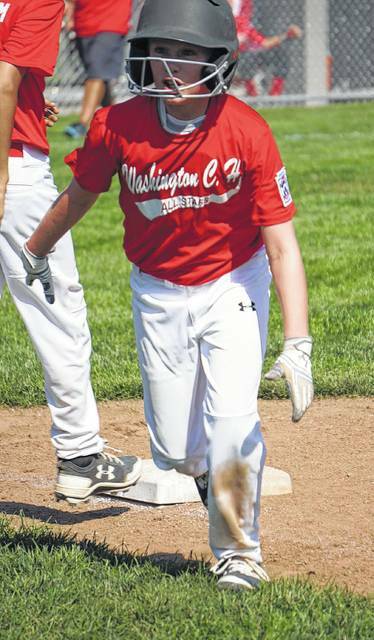 12-year-old all-stars exit the field after an exciting 1-0 win over Jefferson in the first round of the State Little League tournament in Maumee, Saturday, July 15, 2017.
https://www.recordherald.com/wp-content/uploads/sites/27/2017/07/web1_Wesley-May-winning-pitcher-vs-Jefferson-7-15-2017.jpgWesley May was the winning pitcher for the Washington C.H. 12-year-old all-stars against District One champion Jefferson at the State Little League tournament Saturday, July 14, 2017 in Maumee.